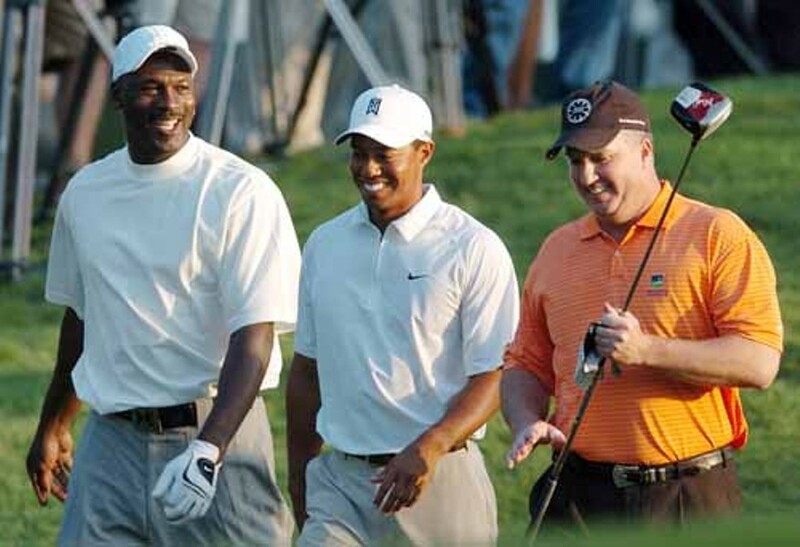 A GREAT DAY IN N.C.: Michael Jordan (left), Tiger Woods and William 'Skipper' Beck at the 2007 Wachovia Championship. It was a sight to behold. Tiger Woods and Michael Jordan, the greatest athletes to ever play their respective sports and two of the planet's most famous people, strolling side by side, sharing laughs amidst the picturesque backdrop of a pristine golf course. This was the first time the good friends had ever been paired together in a golf tournament, and it was happening in Charlotte. Who knew there could be a stage large enough, but it was the Quail Hollow Club in south Charlotte and this was the Wednesday Pro-Am during the 2007 Wachovia Championship. As it had done each year, the Pro-Am groups a professional golfer with two amateurs in an exhibition before the official four-day PGA tournament starts. In this trio, Woods was the pro golfer, obviously, and Jordan was one of the amateurs (in golf terms). The second amateur was Charlotte businessman William "Skipper" Beck. That was three years ago; a lot, obviously, has changed since then. On the eve of this month's Quail Hollow Championship (which itself is the result of a tournament name change last year after Wachovia was acquired by Wells Fargo), the images we once had of Tiger, M.J., and Skipper -- whether it be of them on the putting greens together that day or how we viewed them individually -- have changed in a way that John Grisham couldn't have depicted. He went from his name, Tiger Woods, being synonymous with perfection, discipline and triumph to post-Nov. 27 and him being parodied as "Tiger's Wood," the man who's had more mistresses in four years than probably the rest of the PGA Tour's leaderboard combined. You all know the story of how Woods' world was turned upside down when he crashed his SUV in front of his home in the early morning hours after Thanksgiving; that led to months of previously unknown women telling their stories of how they'd had ongoing affairs with the married golfer. And even as new women continue to surface and more racy Woods-sent text messages make it onto the Internet, the face of the PGA and Nike Golf has returned to the sport. After a fourth-place finish in the coveted Masters tournament, Woods' first competitive event in nearly five months, golf fans (and TMZ followers) everywhere want to know what other tournaments he will play in -- most of which will not be as tightly controlled (nor perhaps as friendly) as Augusta National Golf Club. The day after the Masters ended, Woods submitted his entry to play in June's U.S. Open. Many golf analysts have opined that Woods won't miss any of this year's four major championships: the Masters in April, U.S. Open in June, the Open Championship in July, and the PGA Championship in August. But what is less certain is what tournaments he will play in between those four events. On April 15, Woods stunned many sports writers -- and appeased many Charlotteans -- when he announced that his next tournament will be the Quail Hollow Championship, taking place April 26 through May 2. It's not so much a surprise that he's playing here. Since 2004, the only two years he hasn't played was in 2006 when his father Earl Woods was gravely ill and actually died the week of the tournament, and in 2008 when he took a break from golf after having surgery on his left knee. In the four years he's played here, he has three top-five finishes including winning the tournament in 2007. But what was surprising was that he made the announcement in a very un-Tiger-like manner: several days in advance. All eligible PGA Tour players have until the Friday before the tournament (this year, April 23) at 5 p.m. to officially commit to the Quail Hollow Championship. As the world's No. 1 ranked golfer, he's notorious for his last-minute entry into tournaments. Shortly after returning from attending the Masters, Kym Hougham, executive director of the Quail Hollow Championship, thought Woods' decision would still be days away. "Historically, he plays our event. And historically, we don't know until the last minute. And I'm not sure that's going to change this year." But it did change, and perhaps this is a sign of the changed man Woods has vowed to become. He joins an already impressive list of golfers who have committed to play at Quail Hollow, including Stewart Cink, Jim Furyk, Retief Goosen, Vijay Singh, Lee Westwood, and Charlotte native Davis Love III in what will be a field of more than 150 competing. "This tournament has never been about Tiger. I mean, Tiger is a participant, but [we also] get one of the strongest fields in golf," Hougham said. "So we have to do a lot of things anyway, just out of respect for the other players. We have to be prepared with the security, and all of the plans have to be in place. This year might be a little bit different, but I think Augusta is going to soften things a little bit, in that we won't be his first one out ... But we'll be the first tournament that people will be able to buy tickets for."